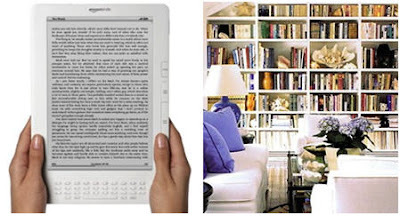 Patricia Gray | Interior Design Blog™: To Kindle or Not? I think you are right on. There are many books that I reread and those should be purchased. The others are perfect for Kindle. My home is covered in books that I can not get rid of, but no longer want, if that makes sense. I have had my Kindle(international) since the end of October 2009. This will never replace my "coffee" table books or picture books as such but I LOVE my Kindle. Like you have said, great for popular fiction, but I've also found that I love having more literary works on there also. Also the huge number of out of copyright books available for free download have made it even more worthwhile. If you want to read newspapers on it and aren't going to cart it around with you, go for the DX. If you want portability for when you travel and don't want to hold something too big, the smaller Kindle is fine. It's perfect for when you are reading late at night and don't want to hold something bulky like a "real" book. As for a colour screen, none of my paperbacks or hardbacks are coloured, so a colour Kindle really wouldn't be necessary for me at all. Get one, you won't regret it. I don't miss having a "real" book in my hands at all, and I think of all the space I'm saving in my apartment by not having "real" books cluttering up space. More room for beautiful objects instead! I sometimes wonder if I could go back to my grandmother's time and do without all the luxuries we now take for granted. Yes, my bookshelves are full of books but as I get older I have become very selective about what I buy.I love that I have my own mini library (I work in a library)and my interests and curiosities are satisfied by my collection of old and new books. There is nothing like a stack of books waiting to be opened up so I can jump right in. Will I ever buy a Kindle? I don't think so; it's not something my grandmother would do and I really like the way she used to live. I think I couldn't live in a place without a lot of books on the shelves. At my parents, in the living room we have more than two-hundred books. But when I'm going to somewhere, where I can't bring any books or bags with me, I just like to take my phone from my pocket, and read an e-book. So, if I can do it with my phone, why should I buy something like this? I Love my Kindle! And I love 'real' books that I want to keep! Without question the Kindle is excellent - transportable with the small size is perfect - you can turn it to read it horizontally or vertically, you can change the text size to be larger or smaller; Additionally and better - it can read the book out loud to you as you are doing Something Else - so its also a book on tape! Wow! I have a nice extensive library of real books as well. Some I want to keep others not. SO I did something amazing for me - I listed the books I do not want on amazon (mine are in great condition so they are Used-Like New), get orders, wrap them in brown paper bags from the supermarket (eco-conscious person that I am), ship it media mail and let the next person enjoy my book and continue a cycle of sharing directly and re-couping a small amount of money spent on a book I dont want in my library. I even helped my 80 year old mother list her unwanted books. Being a notorious "tree hugger" i should embrace kindle, but to me electronics mean work(except for blog reading) and i just cannot bear to loose the pleasure of holding a book in my hands, looking at its spine on library shelves Books add weight and take space in my carry on, get soaked in my bathtub, overtake my house...i guess i am a creature of old habits.. I'm an old fogey, albeit with a modern twist ha ha. My emotional response to a Kindle is no, no way ever. So Fahrenheit 451 to me ha ha. I have the most basic cell phone that I seldom use. I have a four year old Mac iBook that I love. My friends are updating to iPhones and Kindle, and part of staying young is updating to the new technology. I love your solution of having both in your life. But I'm not rushing out to buy Kindle just yet. I agree, there is nothing like looking through your coffee table books for inspiration. I don't thinks those can be replaced by technology...at least yet. You might want to wait before buying the Kindle though. Apple is set to debut a version in a few weeks, reported to be called iSlate. It'll have a color screen as well as black and white, along with many other features. You'll also have access to iTunes store where you'll be able to get the books in audio and visual form. It is wonderful to live in an age when we have such options. Both have their own place. Kindle brings books to people who otherwise have limited access to books, although still quite expensive to use for most people. I love printed books and no Kindle could replace leafing through old publications like "Flair 1953 Annual" or non-fiction books I use over and over. I also love going to the library, imagine sitting for instance in the british library surrounded by books and centuries of scholarship. There is a feeling reading there indescribable that Kindle can never provide. I think kindle is for those books that they don't guard a visual importance. I have an addiction to beautiful books, but I think Kindle will be great for magazines or paperback books. Hi Patricia, Your post is so timely for me, because just this week I've been debating whether or not to purchase a Kindle for my mother's birthday. I believe that there are other electronic readers that have color as well (I think Sony has one?). I feel like you do. I like my books, especially the pretty design or architectural books. I like how they fill space on my shelves, add color to my coffee table and are at a moment's reach when I need design inspiration. However, for the latest nonfiction read... I think I could be persuaded, but I'm not so sure about my Mom. At 70, she, like I, loves the comfort of her books around, loves to feel the weight of the book in her hand and cannot wait to turn each page in anticipation of what it holds. But, I suppose she could be eventually converted. If there is one thing I've learned in life, it is never say never! :) Have a great day! I love reading! So I have the same problem. I think passing the one time best sellers around to others or donating them helps to keep my shelves full of books I love. As for reading electronic books; My husband and I read on our iPhones. The process is incredible (pages turn with sound effects, you can zoom up the type, etc). However, we are eagerly awaiting the iPad. I feel it will have a much easier reading facility. And it is great to have for your magazines, and paperback novels, as well as, good for the environment. That being said, NOTHING replaces the smell of a new or old trusted book. There is something wonderful about returning to a trusted friend and story with all its creases and bends. I savor them. and although I never re-read a book. I do flip through them and remember the story with fondness. Good luck and wait for the color version. It won't be long! I completely agree with you. I own a Kindle and absolutely love it! I did go back and forth though trying to decide if I would like it and worried about 'missing' my books. Not so though, I love how easy the Kindle is to use, to travel with, etc. I still LOVE 'real' books and still buy special books (coffee table books, cook books, design and decorating) .. but love my kindle! I'm not sure what to do. I'd love a Kindle to travel with...but now so many new versions/different manufacturers...I'm overwhelmed with choices! Thank you for including Osa Johnson's autobiography "I Married Adventure." For info about the Martin and Osa Johnson Safari Museum visit www.safarimuseum.com and for info about the Martin + Osa clothing brand see www.martinandosa.com. I really like the idea of a Kindle for travel or nighttime reading when you don't want to hold a heavy book or keep your partner awake (in my case, as he goes to bed early and I like to stay up and read!). I haven't "kindled" yet. Now, that doesn't mean I eventually won't. It's just difficult to imagine curling up on that down pillow with a Kindle. But, perhaps I will change my mind. I just hope that books or magazines don't become extinct. It's getting scary! I completely agree. VERY well said. I'm not going to put the latest James Patterson in my dining room built-in, but sense and sensibility? YES!!! There is a time and place. And it's green! I totally agree, there is a place for both, just like I use my ipod to listen to music at the gym and still buy CDs to listen at home. I have a novel coming out this spring ( my first!) in both formats so I can't wait to see the results! I am a book collector, compulsive reader, book LOVER and former librarian. I vowed never to buy a Kindle. Guess what? I bought one and am crazy about it. I recently went on a trip that allowed only one suitcase (for 15 days!) so was stumped. What did I want to read at night? How many books should I take? How much would the books weigh? Hence the Kindle purchase. I spent 15 glorious days immersed in historical homes and 15 glorious nights with essentially a Barnes & Noble in hand. I could download (for $9.99 each) books about the sights I was seeing. If I wanted I could download "palate cleansers". Now that I am home I can read anything I want while waiting to check out at the grocery store, waiting for an oil change or car wash; the list is endless. Yes, I still purchase "real books" but don't know what I would do without my Kindle. I weighs next to nothing and slips into the side pocket of my purse. My first reaction to the idea of a kindle was no way. I like books. I should say I love books and as someone else said, I am thrilled to have a stack of books waiting beside my bed. I keep most of the novels and non-fiction that I buy; I don't buy coffee table books although a few have ben given to me. I don't buy much in the way of BESTSELLERS either, and since I have a degree in English Lit, I have many books considered classics. Still, none of them are fancy leather bound or even hardcover. They will age and fall apart in my lifetime. I just can't imagine a home that isn't filled with books. Even if I don't re-read them I keep them. Obviously I have book issues! And you may have guessed that my home decor is not minimalist! Hi Patricia, My bookshelves are filled and I have given away many!! Kindle, with an even larger screen and big print would be great for catching up on classics and reading those you may not want purchase! I absolutely love my Kindle for travel but that is the only time I use it and if it broke today I would buy another tomorrow. There is nothing like the crack of opening a brand new book and thumbing through the pages. And the beauty of the new clothbound Penguin classics can never be replicated in a Kindle. I have no idea what a Kindle is or even looks like until I saw the picture in your blog. I couldnt imagine reading a book from a computer although I can see some benefits like when you are on a plane and dont want to carry a heavy book on board etc. I think school students could find it useful as well...kind of cool to read their compulsory English books on a gadget! So I think a kindle (how did it get that name?) has it's place but for me would never replace the joy of holding a real book. i believe that are some classic books out there and everyone's classic category is different. buy your classics, hold them in your hand. for other reads, the kindle is brilliant. i also the option to get various newspapers this way ... makes reading on the go so much easier. Most of the books I buy are art books so Kindle is a bit pointless for me. It would do for books that don't have heaps of images, but Kindle just isn't there with the graphics. I love the "idea" of Kindle and friends who have them rave about their features and convenience, but I'm still torn. What about all the time and effort that goes into the "art" of a book? The cover illustrations, choice of typeface, finish and weight of the paper... I really appreciate those things and would miss them so could never go exclusively electronic. This is a good question...I do like to hold a book, but I can see where a Kindle would have a place. I'm not sure now though if I would purchase one, something to think about. One of my guilty pleasures is sitting with a hot cup of coffee and a good book on my favourite end of the couch. I love the sound of the pages turning, and I love the "old paper" smell that library books, in particular, offer. I don't think I'll ever give up the good old ink on paper version, but I must admit that I'm curious about electronic books--especially after seeing all the positive reviews above. the amazon kindle is very hot hot hot. this device sounds very interesting, it looks very high tech. I just received Kindle for Christmas. The very best thing about is: you can load any newspaper or magazine and read to your heart's content while flying! No heavy books; no making decisions as to which books to take; no buying newspapers at the airport. For that reason alone, I just love it! Hi my sweet friend!!!! I had no idea you were back on your blog. What a fantastic birthday surprise for me today to find you alive and well in the blogosphere. I adore my kindle. And of course I will always have real books too. Especially design books and coffee table books but where do I go to read novels, or self-help, or business books and the like...well my kindle of course. I have had it for almost a year now and can't imagine life without it. I vote Kindle! I got one for my birthday and have no regrets - it's a great way to bring a stack of books on vacation without overloading your suitcase. It's small enough to keep in your purse, allowing you to read on the go. There are still some books I prefer to buy "the real thing" - but the kindle is so easy to read/easy on the eyes - it's so fun to read I think I read more now that I have it! Also, you save a ton of $$$ reading new bestsellers that are only in hardback. For time being I stick to them and then, when I really have a need to get into the new media ever? I might change my mind! I was convinced that I had no interest in Kindle until I read your blog. My thoughts were the same about "holding the book in my hands". But I had not considered how many books I buy and never read or the ones I scan and don't "just love" that end up in my shop. Thanks for broadening my perpective. Absolutey for me it has to be the 'real thing'. With a Kindle the books would sit hidden away and temporarily forgotten; I much prefer to have shelf full of tatty spines as a constant reminder of what I'm missing. I totally agree that there is a place for both. I love being surrounded by my collected favorites, in stacks around our home, but the Kindle is perfect for those books that I'll probably read just once. And, in some cases, having a book in both formats is a treat! Currently I'm enjoying "Shantaram" by Gregory David Roberts and because it's 933 pages, having it available on my Kindle makes it super convenient to enjoy during the day, but it's also a delight to hold this incredible book and "escape". My husband gave me my Kindle for Mother's Day last year and I love it! I love real books too, but to travel with Kindle is fantastic! My carryon has often been as heavy as my suitcase-but no more! I really love being able to read the first chapter of any book at no charge, because it almost never fails, that I finish a book in the middle of the night and need another. I don't even have to get out of bed to have one delivered! I DO NOT like that my version is not color and does not have a backlight! I have to attach a booklight! The Barnes and Noble one allows you to share books and the IPad will be color, but bigger and heavier-soooo, you do have options! I am so jealous of your first edition of I Married Adventure. A couple of months ago I went searching for it with a book jacket to no avail. You are not only an outstanding designer, you have good taste in books. That said, kindles are a fantastic invention.